A Beautiful Ruckus: Marriage and Multiples: The Importance of "Away Time"
Marriage and Multiples: The Importance of "Away Time"
But based on what people have said, I’m getting the feeling that Sean and I are not alone in this huge challenge that we face to stay connected. Whew, it’s hard work isn’t it? So today, I’m going to dust off a portion of the original post that I didn’t publish and share another marriage tidbit that we’ve learned. It is vital to our marriage that we have time away from the kids…and each other. As much as I like the guy and he likes me, we both like each other more when we have a complete break from everything that is family. There is a lot of stress in caring for kids all day long, and then caring for kids AND a husband every evening. Likewise, I’m sure Sean would agree that working all day long and then coming home to a wife who still has to use up her 30,000 words a day quota and four crazy monkeys can get a little draining. The kids have needs. And so do the parents. It’s not bad to need a break from each other to recharge. I’ll be honest, it took us a long time to figure this out. Initially, it was “I’ve been with the kids” or “I’ve been at work all day” and I just want to see my partner in this marriage. It was around January before we realized that this wasn’t a perfect plan for a successful relationship. In December, we hit a patch where both of us felt pretty trapped in our respective roles. We felt like we didn’t have much freedom to “escape” and see the outside world. The end of December and January were pretty miserable. I told Sean he needed to go hang out with a friend, go see a movie…hey, even leave for the weekend. He didn’t want to because he said he loved us and would miss us. I told him that it would help us for him to take a break. And then I insisted on it. He made plans to take a few hours each week for a month to go do stuff with buddies that was completely unrelated to me or the kids. I wasn't invited, which was exactly what needed to happen. It started to help our marriage almost immediately. And then he turned around and made sure that I had the opportunity to make it out for a couple of hours each week as well. Score! 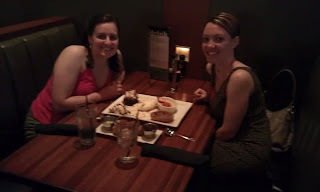 A recent Girls' Night Out with my sister-in-law, Sarah! We went out for dessert! Okay...more like a lot of dessert. Lol! That's what happens when you let two mamas out of the house! We don’t always get our alone time every week, but at least every other week, we make plans individually to get out of the house. For him, it might be breakfast with a friend, a movie with a coworker, or a good book and a Panera bagel. For me, it might be my multiples meeting, my monthly bible study, dinner out with a friend, or a chance to go to a cafe and write for awhile. It has been key in our getting along together better. Since we’ve come to the understanding that time away is healthy, relaxing, and good, it’s taken away the guilt and given us permission to have fun! After our time off, we come back much happier and ready to shoulder our responsibilities. Note: As I write this post, I’m enjoying some much needed "away time." Sean won a gift certificate from work for a free massage and sent me out to use it. He also told me to stop for a pedicure and lunch and not come back until late afternoon. I’m so excited to get home to see my kids and hubby…but I think I'll give it another hour! Love, love, love this. Love how honest you are! Marriage is hard, but with multiples it's even harder. Taking a break from your responsibilities is a wonderful way to recharge. Absolutely! And having your spouse encourage you to get away is even better! Reading this from a girls trip to Tan Tar A at the lake! We do this every year. 4 days, 3 nights....and when we come home we all feel refreshed and refocused on our children & husbands. That is an AWESOME idea! A whole weekend away to just hang with friends! I love it! I hope you had a great time this weekend! I love this post! This is such great advice and so true, my husband and I need to start doing this! I'm so ready to figure it out. A 5 year old, 2.5 year old twins and work, wife, mom, life....everyone's needs & demands come first. Glad to read this post as it makes so much sense. Brianne, I totally get that. I think most moms feel the same way. We consider it part of our job to put ourselves on the back burner and take care of our families. It's a huge, precious job that we've been entrusted with. But what I've discovered is that I do a much better, more loving job of taking care of my family if I get that little bit of time off. Sometimes, it's really hard with the pressures of life though. One thing that worked well for me a couple of weeks ago, was that I left for dessert with my SIL (see picture above) just before the kids went to bed for the night. It let me still help with the majority of the dinner cleanup and evening routine, but still escape for a couple of hours. Could you maybe try something like that? Totally agree with this! Everyone couple needs alone time to themselves to recharge the old batteries. I agree that alone time or time with other adults is so important. Both parents are working so hard each day into the evening that the time away really lifts the spirits. Thank you, as always, for sharing on Multiples Monday on Capri + 3. It is always fun to see what your family has been doing.